Finding R and S configurations for non-traditional molecules can be somewhat tricky. This video teaches you how to quickly find configurations of molecules presented in a Newman Projection. Learn how to view the molecule and quickly assign priority WITHOUT the need to redraw into a sawhorse projection. 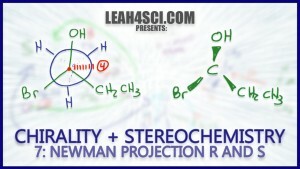 This is Video 7 in the Chirality/Stereochemistry Video Series. Click HERE for the entire series. Thank you, Sigrid! I’m very happy to help!